NEW PALESTINE, Ind. – It was not the debut to which long-time assistant coach Richard Benberry was looking for as he took over the Kokomo Wildkats football team. Twenty second into the game, New Palestine was on the scoreboard – and it was downhill from there in a 77-0 final score and third consecutive opening-week loss for Kokomo. Eyes around the state were focused on this game as it was the WHMB TV40 Game of the Week and the first-time the two programs had met on the gridiron. The Class 5A contest featured the defending state runners-up and No. 8 Kokomo on the road at the 2014 4A state champion and current 5A No. 3-ranked New Palestine – a squad that has not lost a regular season game since Oct. 12, 2012, a streak of 45 consecutive wins. In fact, sixth-year Dragon coach Kyle Ralph entered the game with a 60-4 record – all four losses were in tournament play. But on paper, the game was about numbers – Kokomo graduated 15 starters while New Palestine returned nearly 18 starters and had a key transfer who dominated the action. That is something Benberry noted during the WIOU Coaches Show interview on Saturday morning. “I would say our guys played hard and showed character,” he said of the way his team handled the mismatch. In front of nearly 2,500 fans at Kelso Stadium, Delta transfer Charlie Spegal was the star of the show for the Dragons. Before the first quarter ended, the junior carried the ball 10 times for 140 yards and five touchdowns (6, 25, 8, 12, and 10 yards) to give New Pal a comfortable 42-0 lead. In the first 12 minutes, Kokomo had one first down, 13 yards on offense and punted the ball three times with an 11.3 average against the relentless New Palestine defense. By halftime, the score was 70-0 with Spegal gaining 221-yards and a school-record seven rushing touchdowns. New Pal had 410 offensive yards in the first half (238 rushing and 172 passing) while holding Kokomo to 54. The second half was played with a running clock and Spegal on the bench. Kokomo quarterback Levi Hrabos, a Northwestern senior transfer, led the team with 21 rushing yards and 94 passing (7-21-2). Steven Edwards caught two passes for 53 yards. The loss marked the first time the Wildkats were shutout since a 49-0 loss to Hamilton Southeastern on Oct. 21, 2005. It was the worst defeat for Kokomo since Muncie Central downed the Kats 68-0 on Sept. 3, 2004. 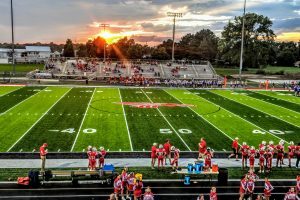 Kokomo (0-1) will make its Walter Cross Field debut this Friday at 7:30 p.m. against Plymouth (0-1), a Class 4A team that lost to East Noble 16-6.